Zika virus infection causes a mild illness known as Zika fever, Zika or Zika disease. Zika virus is spread to people through the bite of an infected female Aedes mosquito. 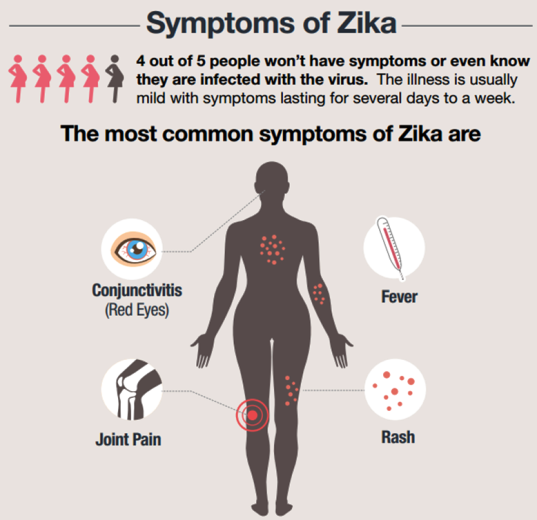 The most common symptoms of Zika virus disease are fever, rash, joint pain, and conjunctivitis (red eyes). The illness is usually mild with symptoms lasting from several days to a week. Severe disease requiring hospitalization is uncommon. Outbreaks of Zika have occurred in areas of Africa, Southeast Asia, the Pacific Islands, and the Americas. 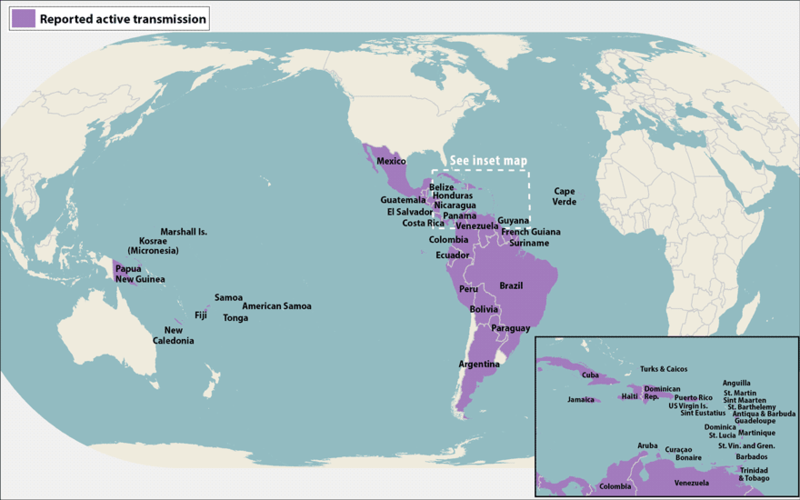 Because the Aedes species mosquitoes that spread Zika virus are found throughout the world, it is likely that outbreaks will spread to new countries. In December 2015, Puerto Rico reported its first confirmed Zika virus case. Locally transmitted Zika has not been reported elsewhere but cases of Zika have been reported in returning travellers in the USA and UK. There is no vaccine to prevent or medicine to treat Zika. Travellers can protect themselves from this disease by taking steps to prevent mosquito bites. When travelling to countries where Zika virus (see map below) or other viruses spread by mosquitoes have been reported, use insect repellent, wear long sleeves and pants, and stay in places with air conditioning or that use window and door screens. 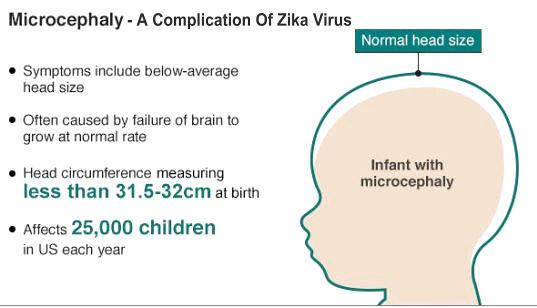 Zika disease is linked to microcephaly in newborns of infected mothers. The current U.S. Centers for Disease Control and Prevention (CDC) issued travel guidance on affected countries, including the use of enhanced precautions and considering postponing travel, and guidelines for pregnant women. Ireland issued a similar travel warning, while other governments, such as Colombia, Ecuador, El Salvador, and Jamaica, advised women to postpone getting pregnant until more was known about the risks. • About 1 in 5 people infected with Zika virus become ill (i.e., develop Zika). • The most common symptoms of Zika are fever, rash, joint pain, or conjunctivitis (red eyes). Other common symptoms include muscle pain and headache. • The illness is usually mild with symptoms lasting for several days to a week. • Severe disease requiring hospitalization is uncommon. 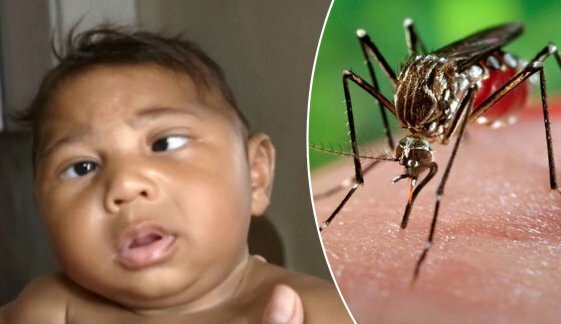 • The symptoms of Zika are similar to those of dengue and chikungunya, which are diseases caused by other viruses spread by the same type of mosquitoes. • See your healthcare provider if you develop the symptoms described above and have visited an area where Zika is present. • If you have recently travelled, tell your healthcare provider when and where you travelled. • Your healthcare provider may order blood tests to look for Zika or other similar viruses like dengue or chikungunya. • No vaccine or medications are available to prevent or treat Zika infections. • Aspirin and other non-steroidal anti-inflammatory drugs (NSAIDs), like ibuprofen and naproxen, should be avoided until dengue can be ruled out to reduce the risk of haemorrhage. If you are taking medicine for another medical condition, talk to your healthcare provider before taking additional medication. • If you have Zika, avoid mosquito bites for the first week of your illness. 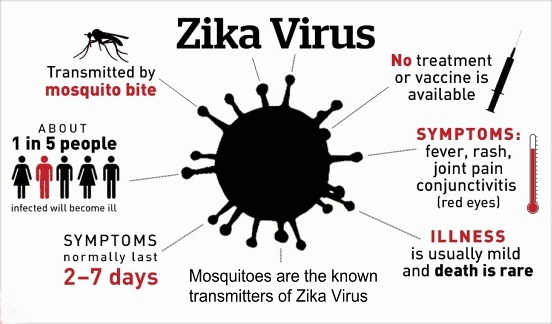 • During the first week of infection, Zika virus can be found in the blood and passed from an infected person to another mosquito through mosquito bites. • An infected mosquito can then spread the virus to other people.